Dutch speed king Theo Bos has pulled on the prestigious rainbow jersey awarded to track cycling's world sprint champion three times, but his long supremacy in the top of the bill event is now under threat. At the 2008 world championships, Bos lost a quarter-final to eventual champion, Chris Hoyof Britain, the first time that Bos had failed to win a sprint round for three years. "I have to give credit to Hoy. He beat me fair and square. Now I know there will be some work to do before the Games," he said. 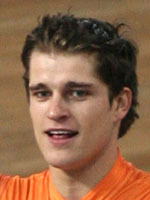 Bos, born in Hierden August 22, 1983 and brother to speed skating's world champion and twice Olympic silver medallist Jan Bos, shot to prominence by winning the 2004 world sprint title, sending him to the 2004 Athens Games as the man to beat. But beaten he was, only just though, in a come from behind win by Australia's Ryan Bayley in the final. Bos says he now has the experience to avoid making the same kind of mistakes he did four years ago - he feels over-training made him ill at the run up to Athens. Despite these two high profile defeats, Bos still takes his lithe frame and five spoker wheels to Beijing as the biggest name in the game and while wary of his rivals, feels that a 20-year-old French newcomer may be his chief rival. "Kevin Sireau is my biggest threat, he's a huge talent. But he maybe lacks a bit of experience." Bos's other honours include individual world titles in the kilometre in 2005 and both the sprint and keirin titles at the 2006 championships, giving him three world golds in two seasons. He then retained the coveted sprint title in Mallorca in 2007 dominating France's Gregory Bauge over two legs in the final. He also holds the world record of 9.772sec over 200m, set at a World Cup event at Moscow on December 16, 2006, smashing the 11-year record of Canadian Curt Harnett, who clocked 9.865sec at altitude in Bogota, Colombia, on September 28, 1995. At Beijing, Bos will also be a major contender for a medal in the team sprint after claiming a world bronze in 2008 with teammates Teun Mulder and Tim Veldt. Mulder has taken Bos's mantle as the Dutch keirin hope and the kilometre is no longer an Olympic event, all of which should sharply refocus Bos on the job at hand, winning track cycling's most prestigious gold, the men's sprint in China.